The Digital Library of Georgia is pleased to announce the expansion of the Savannah Historic Newspapers Archive. 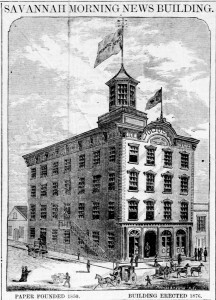 The Savannah Historic Newspapers Archive provides online access to seventeen newspaper titles published in Savannah from 1809 to 1880. 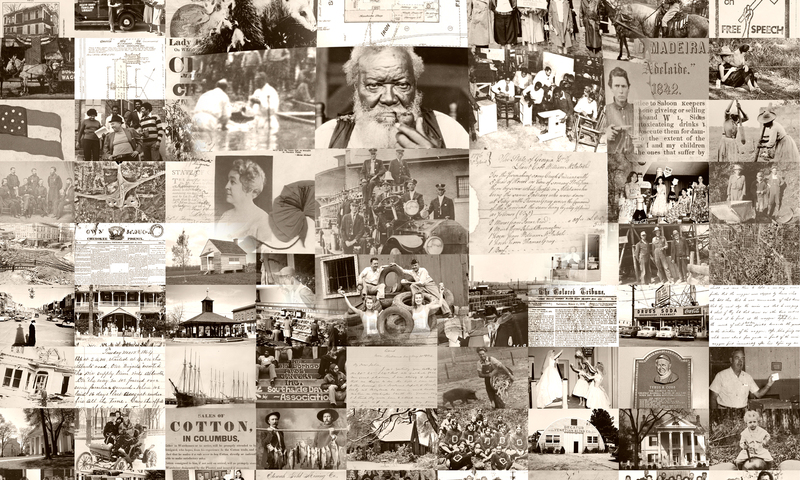 Consisting of over 103,000 newspaper pages, the archive provides historical images that are both full-text searchable and can be browsed by date. Additionally, the site is compatible with all current browsers without the use of plug-ins or software downloads. The archive now includes the following Savannah newspaper titles: Daily Morning News (1850-1864), Daily News and Herald (1866-1868), and Savannah Daily Herald (1865-1866), in addition to the titles previously included in the archive: Daily Georgian (1835-1847), Daily Republican (1839-1840), Daily Savannah Republican (1829-1839), Georgian (1819-1823, 1829-1835), Republican and Savannah Evening Ledger (1809-1816), Savannah Daily Georgian (1853-1856), Savannah Daily Morning News (1868), Savannah Daily Republican (1818-1824, 1840-1852, 1855-1858, 1866-1867), Savannah Georgian (1825-1829, 1847-1849), Savannah Georgian and Journal (1856), Savannah Morning News (1868-1880), Savannah National Republican (1865), Savannah Republican (1816-1818, 1824-1828, 1853-1855, 1858-1865), and Weekly Georgian (1839-1841). The Savannah Historic Newspapers Archive is a project of the Digital Library of Georgia, as part of the Georgia HomePLACE initiative. The Digital Library of Georgia is a project of Georgia’s Virtual Library GALILEO and is based at the University of Georgia. Georgia HomePLACE is supported with federal LSTA funds administered by the Institute of Museum and Library Services through the Georgia Public Library Service, a unit of the Board of Regents of the University System of Georgia. 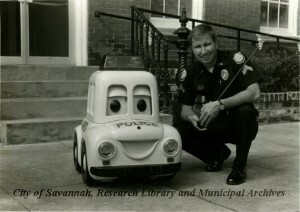 The City of Savannah, Research Library and Municipal Archives has recently made a new collection available through its online Digital Image Catalog: Public Information Office–Photographs, 1948-2000. This collection contains digitized photographs, slides, negatives, and manuscript material maintained by the city of Savannah’s Public Information Office, and document city-sponsored services, programs, and significant city events. There are also photographs of politicians and employees of city bureaus. Cpl. K.R. Porter with RC Robot Patrol Car. City of Savannah, Public Information Office. Courtesy of City of Savannah, Research Library & Municipal Archives. Images in the collection were used in both internal publications that included reports, newsletters, and identification materials, and promotional materials that advertised city services and programs. There are numerous images of Savannah city buildings that include City Hall, the Broughton Municipal Building, and the Civic Center, and other locations that include parks, street scenes, and historical structures. We hope that you visit this collection and congratulate the City of Savannah, Research Library and Municipal Archives for providing another informative online resource.